Ants are America’s # 1 nuisance pest. Springtime invigorates us all: the warmer weather compels us to venture outdoors; the increasing daylight awakens certain mammals from their seasonally-appropriate nap; and, the changing temperatures rouse carpenter ants to another season of unabashed foraging and nest expansion, which, unfortunately, is usually accomplished at the expense of our homes. Carpenter ants are the only species of ant that will establish an adjunct (satellite) nest in an area which is unlike the environment of the main nest. The main nest can be found in an area that is naturally moist with a high level of humidity, while satellite nests will be established in comparatively drier locations (inside or out), with a lower relative humidity. Nest construction for the carpenter ant is a process where the ant removes a piece of wood with its mandibles, and deposits this grain in a common repository. Unlike termites, carpenter ants are unable to digest wood, so the end-result, when lots of ants are conducting the same, repetitive task, is an accumulation of sawdust in an unexpected area, with a seemingly unknown point of origin. It’s difficult to eliminate this common household pest, so early detection is critical and it’s important to work with a trained professional who employs an integrated pest management approach. Modern offers a HomeCare Green Program that protects your home from 60 pests and the diseases they carry, including carpenter ants. 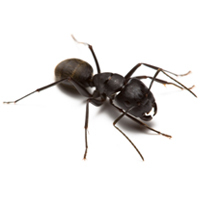 For more information about carpenter ants, visit our website or call us at 1-800-323-378.